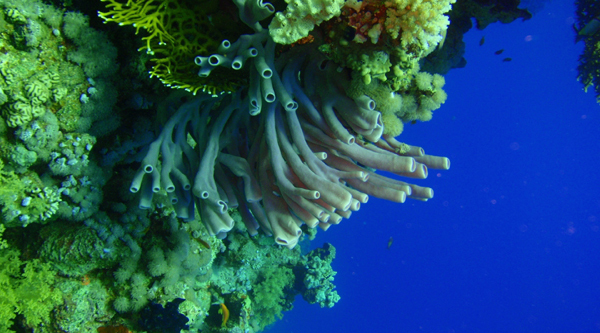 Here is the list of the major families of fishes found in the Red Sea with a short description. These fishes a diver is likely to encounter during his Red Sea underwater exploration. 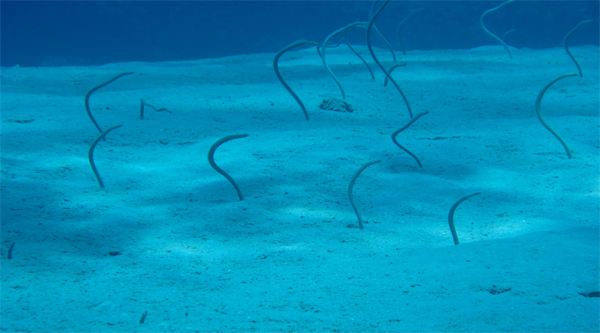 Garden eels - Colonies of 100 to 1000 or more individuals are found in sandy bottoms, at depths ranging from 10 to 80 feet. You will find them rising vertically out of their holes, looking like plants growing out of the sand. Flashlight fish - has a pouch below its eye which contains luminescent bacteria which emit a powerful glow at night. Large eyes are typical for creatures living at low light levels. 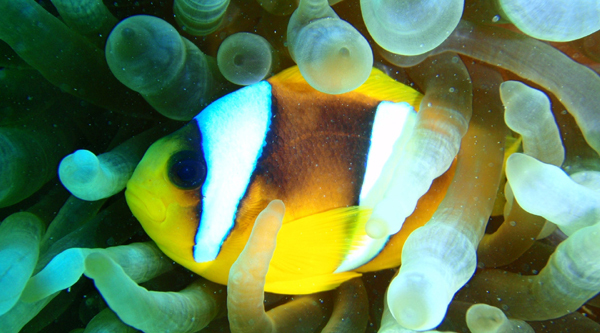 These fish are among the most fascinating fishes in the Red Sea. Squirrelfishes - are red-orange fish about a foot long, with large eyes adapted for seeing at night. During the day they are found in caves or crevices; after dark they roam the reef looking for prey. Groupers/Coral grouper - are from one of the largest families of fishes, ranging in size from ones which can grow in excess of 200 pounds, to the tiny ubiquitous goldfish about 4 inches in length. As for Coral groupers they are reef dwellers, generally hanging out in holes to ambush prey. Hawkfishes - usually sit on topof small coral heads to ambush unwary prey. 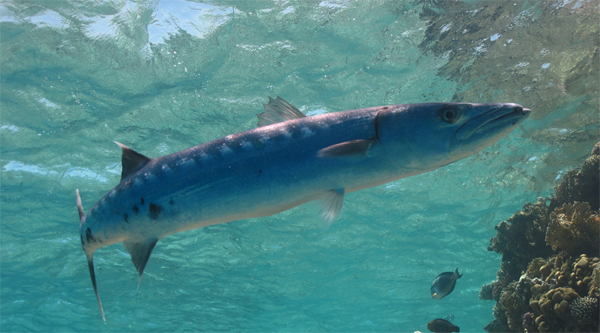 Jacks - in search of prey sometimes can swim in vast schools near walls or reefs adjacent to deep water. At Shark reef of Ras Mohamed, the school can be so dense that from a distance, they look like another reef. While they hunt small fish, sharks often hunt the jacks. Silver sweepers - tiny, almost transparent silvery fish, are found in vast schools, generally inside caves and around shipwrecks. Another commonly used name for them is glassfish, because of the transparency of their bodies. Wrasses/Napoleon wrass - are a diverse family, ranging in size from tiny cleaner fish two inches long to the giant Napoleon wrasse. Also called Humphead wrasse, this grotesque creature is the largest member of its family in the world, ranging up to 400 pounds. Yellow Angelfish/Emperor Angelfish - are perhaps the most admired and beautiful denizens of coral reefs. The Red Sea is no exception, with 3 dazzling species heading the list. The Yellowbar angelfish has a royal blue body with a large yellow mark on its side which resembles a map of Africa. 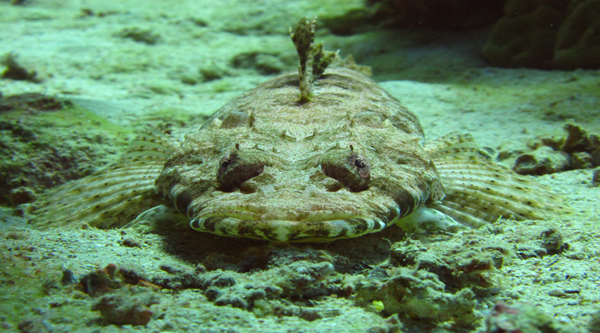 Rockskipper - spends a lot of time on land, can remain for hours out of the water, as long as its gills remain moist. In tidepools or on sandy shores, this little fish out of water hops on top of rocks to eat algae and perhaps to escape predators. Triggerfishes - are oddly shaped creatures with compressed bodies, long snouts and often striking coloration. There are also Titan Triggerfish & Blue Triggerfish at two feet in length, as well as the smallest ones the shy Picasso Triggerfish.